Driveway in a quiet mobile home park bordered by State Forest. Twelve mile hiking/bridal trail within walking distance. Close to a Corp of Engineer lake and park with more hiking trails. Four miles from I-84. 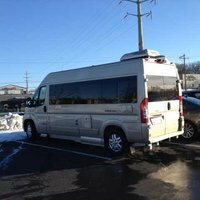 Sorry, but I can only accommodate up to 20' (van, truck camper, small Class C), mainly due to the need to back in and my neighbors usually park their cars directly across the street from my driveway. 15-amp electric, water, and Wi-Fi available. Paved town roads. 25 mph speed zone. Can be narrow and curvy in spots. I am not home much, so there is a good possibility I won't be there when you contact me. You are more than welcome to stay, anyway. If you do, my neighbor will meet you and make you feel comfortable. Couldn’t have worked out better. Dee was out of town but still gladly welcomed my stay and even made sure to have a neighbor check on me. The areas is nice and quiet and the only negative was that I didn’t get to meet Dee in person. Hopefully next time! Very pretty area in Connecticut. She was super friendly and nice. This area is nice and quiet. Dee was so warm and accommodating! It was a privilege to met her and stay with her in the course of our travels. I wish we could have spent more than a night there but were in the middle of pre-existing travel plans. She has wonderful knowledge of her area and a quiet, beautiful setting in the otherwise bustling urban environment around Waterbury. There's not a lot of room right next to her place her place for an RV (we were just in a conversion van) so ask her for details about parking location options. Super responsive communications as well. THANK YOU SO MUCH! !